This ad from 1948 captures the Revere Ware era perfectly. We use our tea kettle almost every day but the percolator had been sitting in the garage due to a fancy espresso machine in the house. 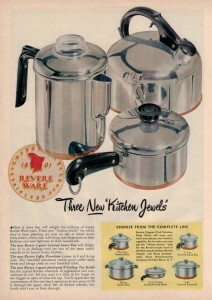 I recently took my family camping which proved to be a perfect opportunity to try out my vintage Revere Ware percolator. 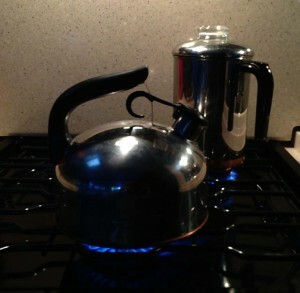 The percolator worked well and made great (and strong) coffee. The directions I’ve found for this percolator say to percolate for 3 to 4 minutes. Before the Revere Ware percolator, the only percolators I’d used in recent history are the large electric ones that make coffee in large batches; these stop percolating on their own. I found myself letting the coffee percolate much longer than 3 or 4 minutes, expecting it to stop, hence the strong coffee. The only trouble I had was a little of the coffee grounds escaped the basket and ended up in the coffee. If I just let it settle for a few minutes before serving, it wasn’t a problem.